If it’s time to Let ‘Em Ride and open the gates to the #NewEraBiz, then we need new models to do so. 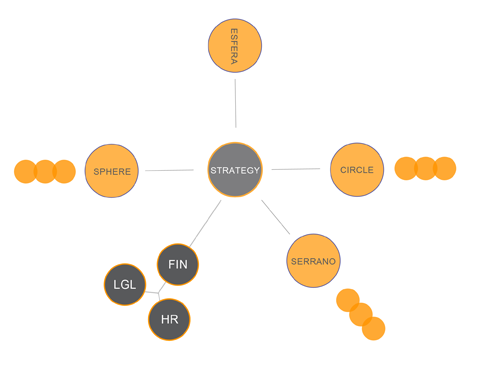 We have written a lot about business models for the #NewEraBiz, but what about organizational models? That’s what we are going to dive into the #NewEraOrg in today’s blog. As a result of the backlash towards the corporate world and its notoriously hierarchial structure, the ‘horizontal’ revolution has started – the vertical walls are coming down. Being ‘flat’ is in vogue and ‘democratization’ is the word of the day. But you can’t run a business without leaders. Even those with noble intentions, the ones who run their business ‘democratically,’ need to have someone who is ‘higher up’ to to organize and tally the vote. Any good business, #NewEraBiz or otherwise, needs good leaders, and with leadership comes hierarchy. But in the same way that a company can have a business model – meaning they endeavor to make profits – and do amazing things for the world, a company can have a hierarchy and still support the growth of the people within it. In the typical corporate hierarchy, you have the C-Suite, led by the CEO. The CEO’s job is to run the show and grow the business. When the company has a problem, the CEO will be the one to fly on his helicopter and find the solution, at least that’s what we’ve been trained to believe. Just look at the 2008 Financial Crisis. Bernanke and Paulson fly in the CEOs of the big American Banks to resolve the once-in-a-lifetime financial crisis, and voila, problem solved (*cough). The obvious problem is that the CEO in this context, was not appointed to safeguard society and look out for the world around him, he was put in his place to look out for the interests of the shareholders in his company – it’s his fiduciary duty. The problem with the traditional hierarchical structure is one of power. Those at the top have the power to make big decisions that can affect large amounts of people (society) and benefit very few (shareholders), and yet there is very little transparency and accountability for how these decisions are made. But if, for example, the 2008 Financial Crisis were put to a vote, would the outcome have been any better? The likely answer is no, as it was an acute situation that required immediate action; it could not have been contained in the way it was without billions of dollars being pumped into the economy in some form or another; had a Referendum been required, the whole economy would have likely sunk before the vote was even cast. It’s like congregating the passengers on Titanic to vote on how to manage a sinking ship – it wouldn’t happen. 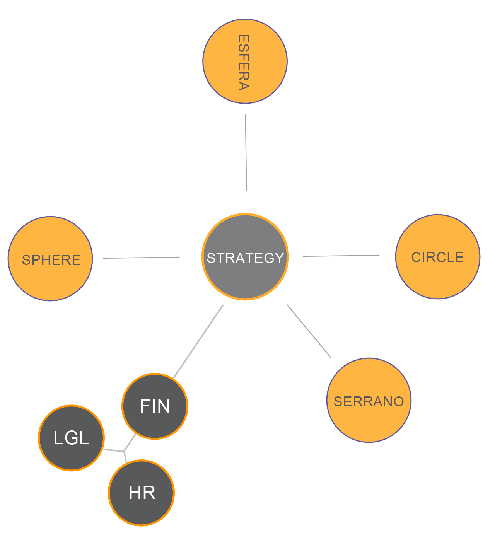 How should we setup a hierarchy in an organization? The power resides within the executives’ hands. The executives design the orders, the managers communicate the orders, the employees’ carry out the orders and the floorsweepers ensure that the marble floors stay shiny and the toilets cleans while the orders are being carried out. But what if one day the floorsweeper, who has PhD in mechanical engineering, has an idea that could be of massive benefit to the organization. Given the structure that we have just talked about above, he would tell the employee, who would tell the manager, who would tell the executive, who would then, based on about a thousand opaque factors, make a decision based on his/her own subjective judgment. In this case the likelihood that the floorsweeper would – a) tell the employee in the first place; b) have even the slightest likelihood of bringing the idea to fruition – is slim to none. That’s because the power is concentrated. In a distributed model, which would be circular rather than tiered, those who develop the strategies and high-level objectives for the organization (typically referred to as executives) would be in their own circle. They would then create new circles around them, based on key strategic areas for development and implementation, and select leaders for those projects (typically referred to as managers). Those leaders would bring in people to help them develop and carry out projects (typically referred to as employees), and those people would require support staff to do less important tasks so that they can focus on their work (typically called floorsweepers). If one day a support staff comes up with an idea for a new system that could be scaled across the entire organization and save the company millions, he can talk directly to the project lead of the circle. If the idea has merit, the project lead can bring the idea into the strategy circle and assess its validity at an organizational level. If the idea is accepted, then it can be spun out into a new circle and the support staff becomes the project lead. The original project lead can continue on with his mission, find another support staff to fill the gap, and move forward without any impact to his/her position or stature in the organization. It means that you can build an organization that can adapt and make scalable changes rapidly. You can create a model where the power is distributed across the organization, so that ideas at all levels can bubble up. It’s a template for an agile and resilient organization, the pre-requisite for any new business that wants to be successful in this increasingly digitalized and fast-paced world. And we didn’t just make this up. 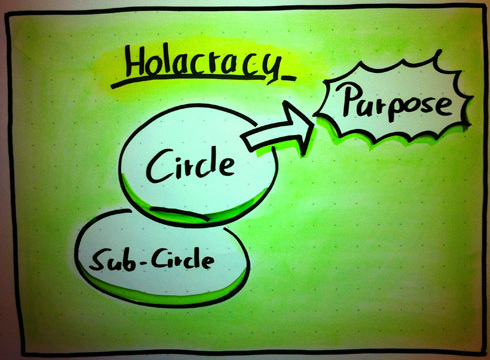 It is being practiced in several forms right now, the most notorious being called Holacracy. Holacracy is defined as a form of organizational governance in which authority and decision-making are distributed throughout a fractal holarchy of self-organizing teams. A holarchy is a hierarchy of self-regulating holons (something that is simultaneously a whole and a part) that functions both as autonomous wholes and as dependent parts. The idea is to shift the power from a traditional hierarchy to a network hierarchy. It’s all based on the principle from the text of one of it’s founding members, Ken Wilber, of a concept called ‘intersubjectivity.’ When we have a clear purpose and more freedom within the organization, we have the space to be creative and the building blocks to innovate. If the pillars of the traditional organization are shifted from: profit to purpose, oversight to trust, regulation to accountability, and power to people; then the whole lens for how the organization is developed needs to be refocused. The most important shift is from people to purpose. Whereas a typical organization has always been structured in a way that fosters an environment of individualistic thinking and ego-based roles, the #NewEraOrg is structured based on the overriding purpose of the organization, thus fostering a collective culture and a set of task-based roles. Big news and buzz was made recently about this because of the implementation of Holacracy by Zappos in the US. In a recent Forbes article on this news, it was described as “a radical self-governing operating system.” Zappos, which is owned by Amazon and has 1,500 employees, is planning to implement the system by the end of the year. While it may seem radical when you place Holacracy in the context of the traditional business operating environment, it doesn’t seem radical when you place it in the context of the world we live it and the speed of change. Just like the body and the process of cell replication, an organization operating in today’s environment needs to be agile, quick and rapidly resilient. It’s not about advocating Holacracy specifically as an organizational model, it’s about templating the #NewEraOrg to have all those characteristics – Holacracy is just a reference point. Overall, the #NewEraOrg needs to be structured to support the growth of the #NewEraBiz Business Model. Simultaneously, the two can be synchronized to create a company capable to making both huge impact and money in a lean and efficient fashion. That’s what we are talking about here. So saddle up the horses, get them circled up and Let ‘Em Ride. Is Legalized Crowdfunding coming to Canada? What Do You Do When You Get an Idea? Part VI: Spurring Innovation - Does Wesley Clover have it right? Why Build a Financial Model? Business Model - What Is It? What Is The End Goal of Market Research? Idea Validation – What’s The Best Way? © 2019 Lumos Business Solutions Inc.